Accidentally deleting a file is a terrible feeling. Not being able to boot into Windows and undelete that file makes that even worse. 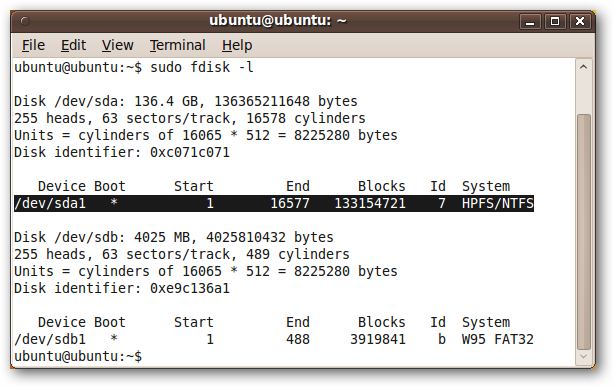 Fortunately, you can recover deleted files on NTFS hard drives from an Ubuntu Live CD. To show this process, we created four files on the desktop of a Windows XP machine, and then deleted them. We then booted up the same machine with the bootable Ubuntu 9.10 USB Flash Drive that we created last week. Once Ubuntu 9.10 boots up, open a terminal by clicking Applications in the top left of the screen, and then selecting Accessories > Terminal. What you’re looking for is a line that ends with HPSF/NTFS (under the heading System). In our case, the device is “/dev/sda1”. This may be slightly different for you, but it will still begin with /dev/. Note this device name. If you have more than one hard drive partition formatted as NTFS, then you may be able to identify the correct partition by the size. If you look at the second line of text in the screenshot above, it reads “Disk /dev/sda: 136.4 GB, …” This means that the hard drive that Ubuntu has named /dev/sda is 136.4 GB large. If your hard drives are of different size, then this information can help you track down the right device name to use. Alternatively, you can just try them all, though this can be time consuming for large hard drives. Now that you know the name Ubuntu has assigned to your hard drive, we’ll scan it to see what files we can uncover. The names of files that can recovered show up in the far right column. The percentage in the third column tells us how much of that file can be recovered. Three of the four files that we originally deleted are showing up in this list, even though we shut down the computer right after deleting the four files – so even in ideal cases, your files may not be recoverable. Nevertheless, we have three files that we can recover – two JPGs and an MPG. 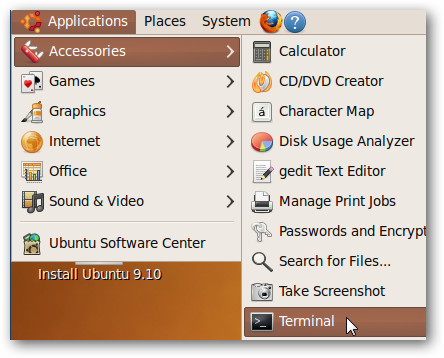 Note: ntfsundelete is immediately available in the Ubuntu 9.10 Live CD. If you are in a different version of Ubuntu, or for some other reason get an error when trying to use ntfsundelete, you can install it by entering “sudo apt-get install ntfsprogs” in a terminal window. To quickly recover the two JPGs, we will use the * wildcard to recover all of the files that end with .jpg. The two files are recovered from the NTFS hard drive and saved in the current working directory of the terminal. By default, this is the home directory of the current user, though we are working in the Desktop folder. Note that the ntfsundelete program does not make any changes to the original NTFS hard drive. If you want to take those files and put them back in the NTFS hard drive, you will have to move them there after they are undeleted with ntfsundelete. Of course, you can also put them on your flash drive or open Firefox and email them to yourself – the sky’s the limit! We have one more file to undelete – our MPG. Note the first column on the far left. It contains a number, its Inode. Think of this as the file’s unique identifier. Note this number. This recovers the file, along with an identifier that we don’t really care about. All three of our recoverable files are now recovered. However, Ubuntu lets us know visually that we can’t use these files yet. That’s because the ntfsundelete program saves the files as the “root” user, not the “ubuntu” user. 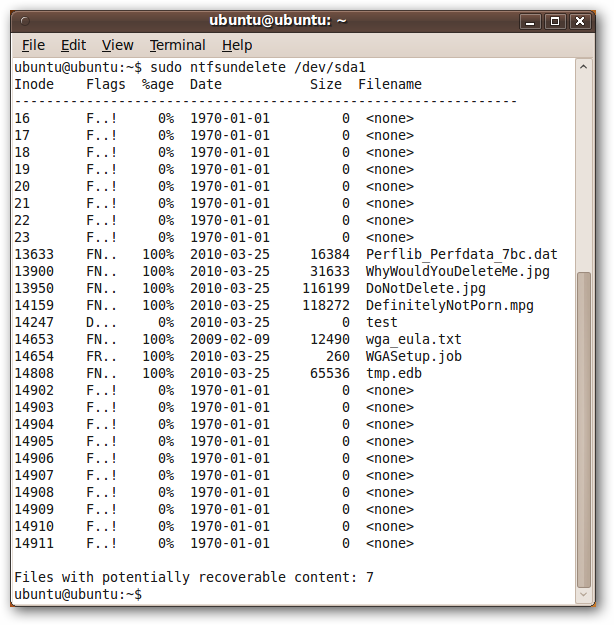 If the current folder has other files in it, you may not want to change their owner to ubuntu. However, in our case, we only have these three files in this folder, so we will use the * wildcard to change the owner of all three files. The files now look normal, and we can do whatever we want with them. Hopefully you won’t need to use this tip, but if you do, ntfsundelete is a nice command-line utility. It doesn’t have a fancy GUI like many of the similar Windows programs, but it is a powerful tool that can recover your files quickly.